Learn to make Best Gulab Jamun Recipe | How to Make Gulaab Jamun With Khoya At Home with a quick video tutorial. Gulab Jamun is a legendary Indian sweet. 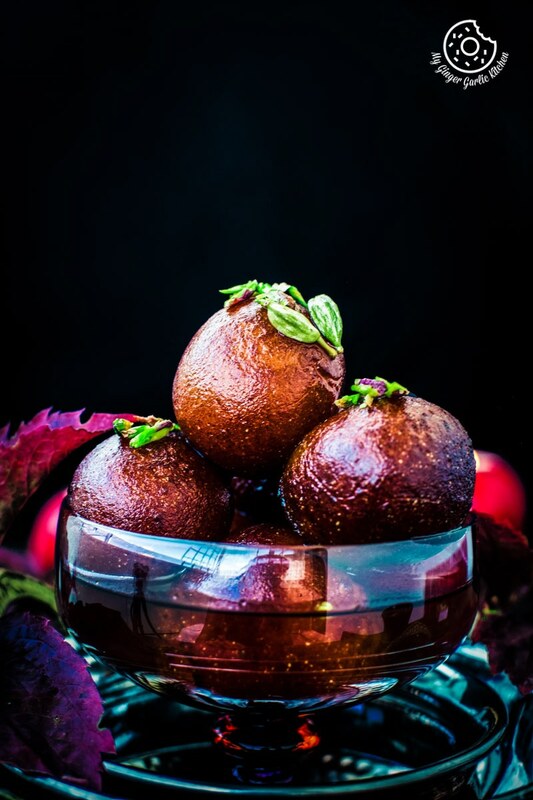 In this surefire recipe, the delicate, spongy and melt-in-your-mouth berry sized deep-fried milk based balls are dunked into the skillfully flavored sugar syrup. 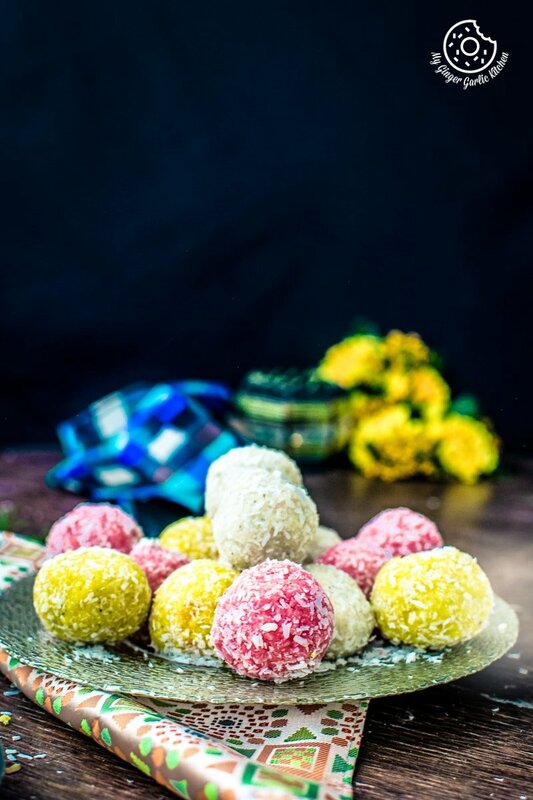 These homemade gulab jamuns made from traditional mawa or khoya tastes the best. Precisely, we are in Fall season. How do you feel about it? For me, it’s a combined feeling. At times when the sun rarely shines, I am overjoyed to see the Fall shades. I just love this beautiful combo of dazzling sun and colorful Autumn leaves. Well, I suppose everyone does that. Isn’t it? But sometimes I also feel a little sad that these shades will soon depart. It’s the festive season: September is ending and October is coming with a lot of festivities. A month-long festive time in India has already begun this month. Yes, currently, most of the India is having a big festive season. This running Hindu festival is Navratri, which is dedicated to Devi Durga (Goddess). Navaratri (नवरात्रि) literally means nine days. Thus, this festival is celebrated for 9 days. Each one of the 9 days are dedicated to 9 forms of Goddess Durga. Thus, people worship the 9 Avatars of the Devi on these 9 days, one on each day. Gulab jamuns are widely made during celebrations and festivals like Raksha Bandhan, Holi & Diwali. 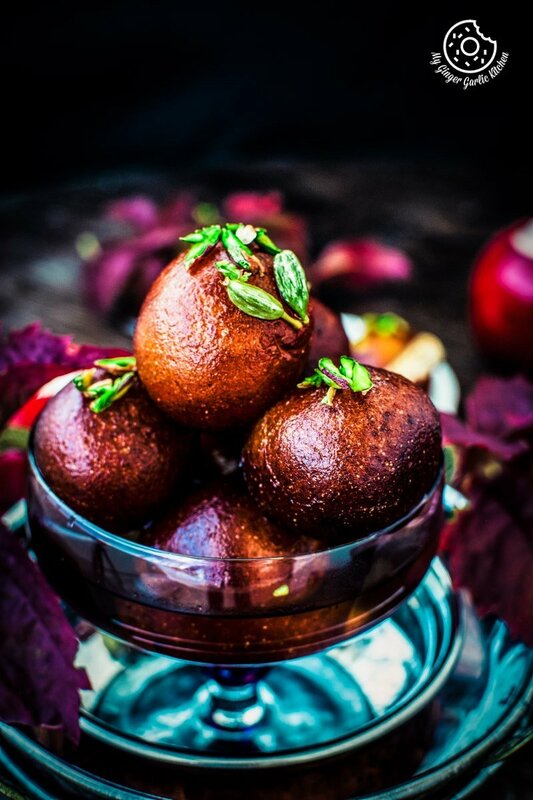 As this is the celebration time, I could not think of a better recipe to share today than this Indian Gulab Jamun (गुलाब जामुन) which was on my list for a long time. And today it felt most appropriate to share this. Gulab Jamun is a milk solid based dessert, so traditionally it is made mainly from milk solids. Today I am sharing a simple and easy way to make gulab jamuns at home but this is not a quick recipe. It takes about 3 hours to get ready for eating. The process includes the dough making, frying and sugar syrup dunking time. 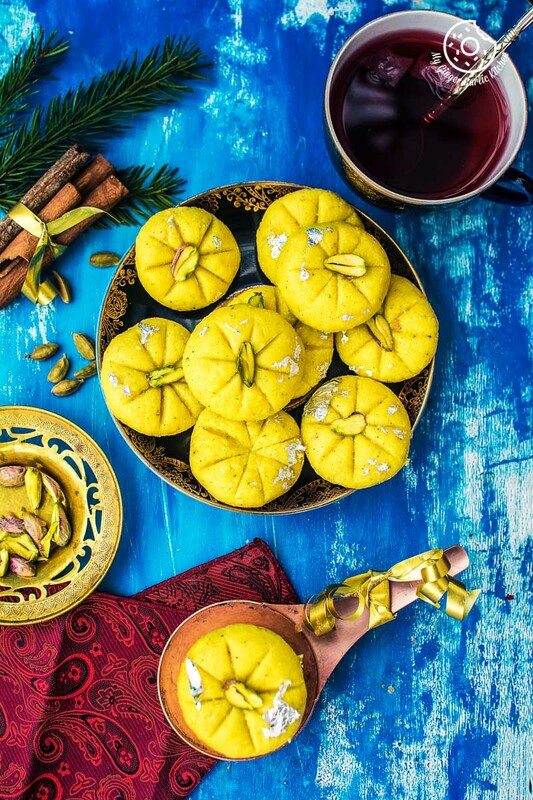 As you now know that khoya is the main ingredient of this recipe, but I also agree that khoya is not available in many places like we don’t get khoya here in Finland. And I also agree that sometimes making khoya at home with the milk is a tedious job. However, this khoya can be made in minutes without any labor. Here, I have earlier shared a recipe for making Instant Khoya with milk powder. But if you don’t have milk powder then you can also make this recipe with paneer aka Indian cottage cheese. What Ingredients are needed for making Gulab Jamun Recipe? All you need is some all-purpose flour, semolina, mawa/khoya or paneer, and oil to make basic and simple gulab jamun at home. Plus, some sugar, water, and lemon juice to make a sugar syrup to sweeten it up. This tastes SO GOOD. 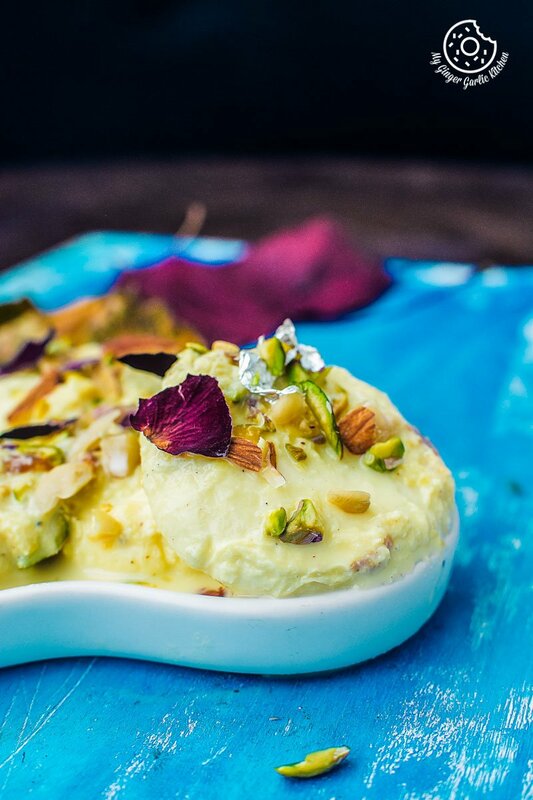 A classic Indian sweet or dessert that is an absolute delicacy which is very famous and is enjoyed in most festive and celebration meals. 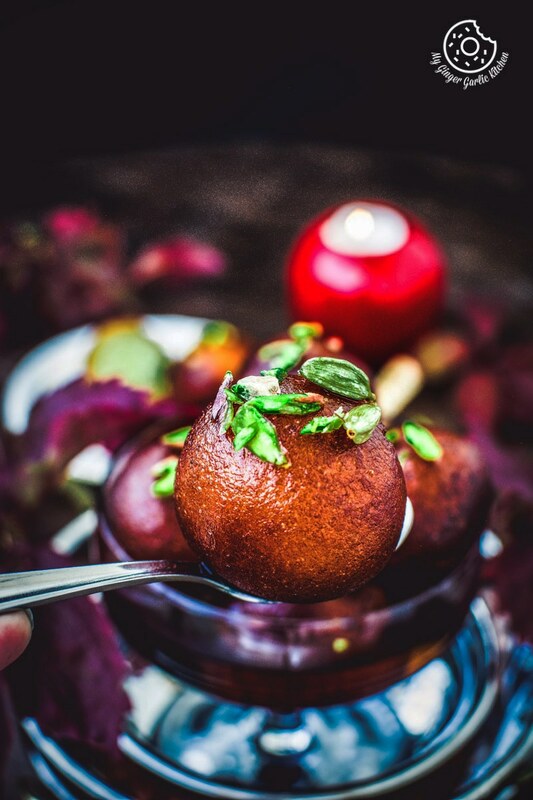 This traditional version of gulab jamun is so silky, melt-in-mouth and so luscious. The literal translation of ‘Gulab’ is Rose flower, and ‘Jamun’ is black plum which is also known as purple Indian berry broadly available in India. 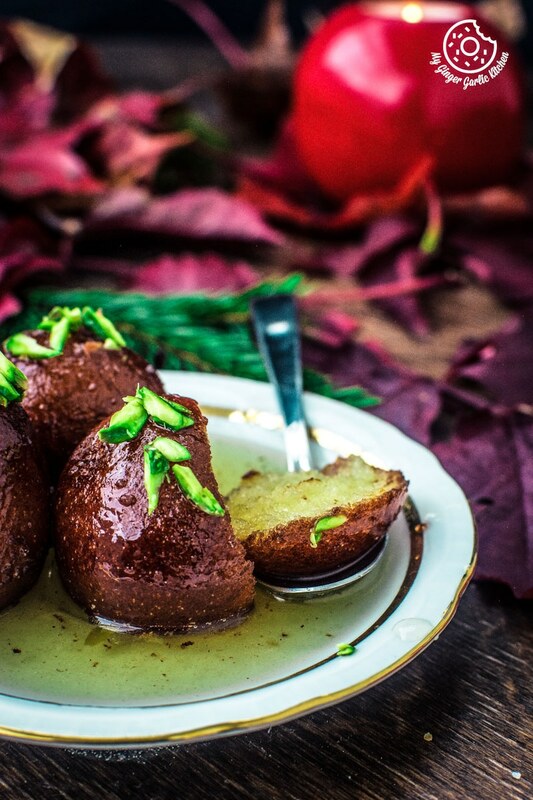 The crispy and fried dough balls are dunked in the sugar syrup which is generally scented with rose water, the resulting large berry sized dessert is called Gulab Jamun. Since this is an Indian dessert, the traditional way of frying these gulab jamuns are frying in the ghee. By using Ghee, they taste so rich, so sometimes when people make them at home, they simply fry them in groundnut oil or any other vegetable oil. Therefore, frying in ghee or oil is totally up to you, but I can assure you that these jamuns would taste awesome either way. Let me answer some questions you might have. 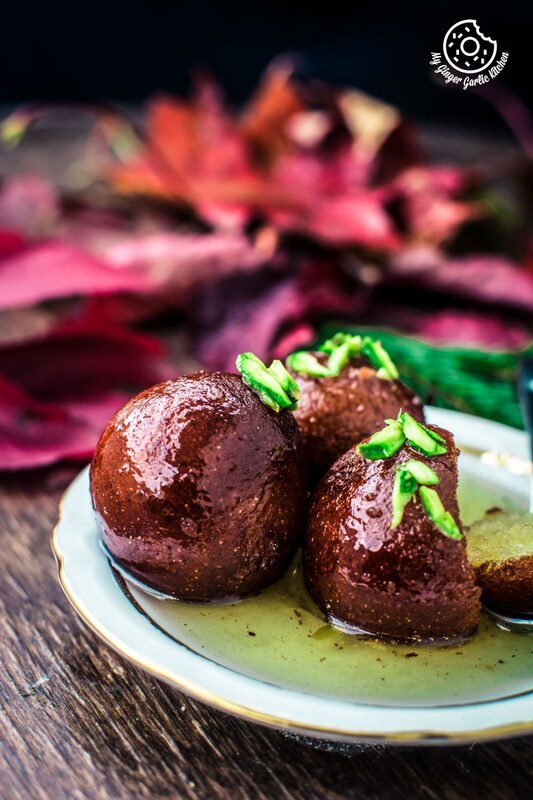 These tips will help you make the best Gulab Jamun at home. How to make the perfect Gulab Jamun? Making gulab jamun is very simple. The only thing which people find complicated is making the dough perfectly. Once you have mastered the dough making skills, then you will never think of buying gulab jamuns from the market again. With this authentic recipe, you can make them from scratch easily. And I guarantee that these sweet jamuns will supercharge your taste buds with their unforgettably rich and pleasant taste. What is gulab jamun made of? Traditionally, gulab jamun is made of khoya and a pinch of semolina/all-purpose flour. Gluba jamun can also be made with the combination of powdered milk and all-purpose flour. Then there is another version of gulab jaumn where suji aka semolina is used as a base ingredient. Gulab jamun can also be prepared using a dough made with a simple bread and milk. Then there are gulan jamuns made with pureed vegetables and fruits such as sweet potato gulab jamun and mango gulab jamun. How long does gulab jamun last? Room Temperature: Gulab Jamuns stays fresh for up to 2 days at room temperature. Refrigerator: They will keep well in the fridge for up to 20 days. If you like you can warm them in the microwave for 15 seconds or simply use a double boiler method. Freezer: You can also freeze them. You can use frozen gulab jamuns for up to 3 months. Simply thaw them at room temperature for at least 30 minutes prior to serving. No, they are vegan inborn. Traditionally, jamuns are fried in pure ghee. 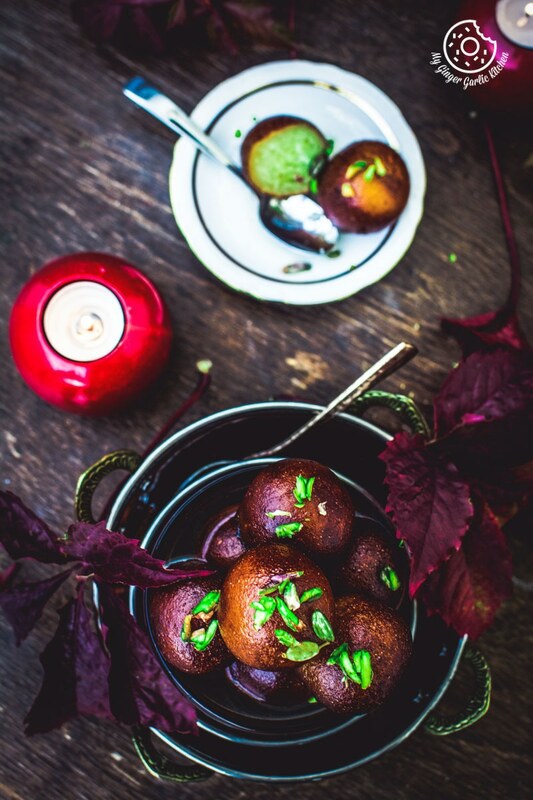 However, you can definitely make vegan gulab jamun using sweet potato puree and some flour. Deep-fry them in vegetable oil. How to make gulab jamun soft? 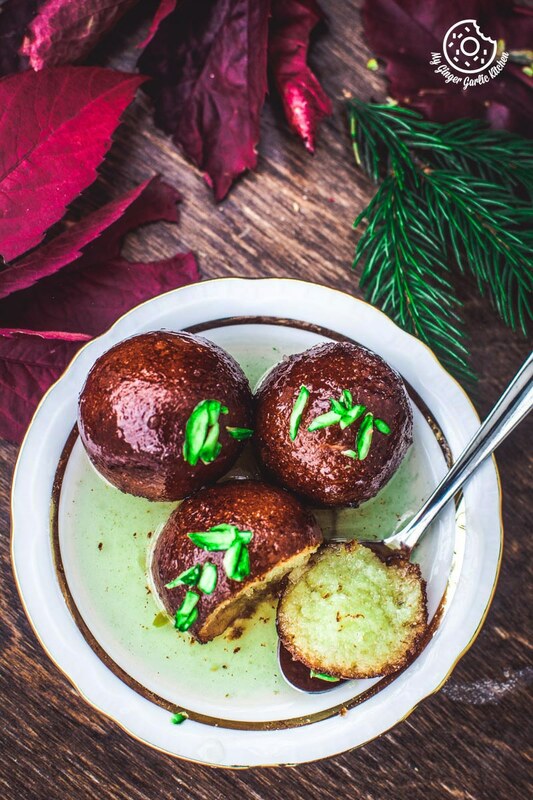 If you want to make soft melt-in-mouth gulab jamun then simply follow these simple steps. Don’t overwork the dough, but it needs to be smooth and soft. For kneading the smooth dough, add milk little by little until you have a soft dough. Shape dough balls with light hands, do not apply too much pressure while making dough balls. Dough balls should not have any cracks. Roll it again to make it smooth, if you see any cuts or cracks on the top. Fry gulab jamuns at medium-low heat. If you fry at high heat, the jamuns will be dark from outside and not be cooked from inside. It will also turn hard. How do you make gulab jamun perfect sugar syrup? To make the perfect sugar syrup add mix the 1 cup of sugar to 2 cups of water. Add 4-5 cardamom pods. Mix with a spoon and then heat at medium heat for 5-10 minutes until sugar is all dissolved in water and it has almost 1 string consistency. Do not overcook the syrup, we only want a sticky consistency. Add lemon juice, rose water and stir well. By adding lemon juice sugar syrup doesn’t form crystals. The sugar syrup thickens when as it cools, so it shouldn’t look too thick. The balls will double up after frying & soaking in syrup so do not make big balls. What should I do if my gulab jamun shrinks? If the jamuns are hot, make sure the sugar syrup where you will be adding the fried jamuns into is at room temperature. If the jamnus are at room temperature then the syrup should be hot but nit boiling hot when you add the hot fried gulab jamuns. If you add hot jamuns to very hot syrup, then they will lose the texture, shape, and they will tighten and shrink. Too much baking powder/soda might cause the gulab jamuns to get too soft, and they break apart when frying. Why does gulab jamun break-in oil? Why do Gulab jamuns crack while frying? The gulab jamuns have to be rolled properly. Roll out such that there are no cracks on the balls. If your dough balls have cracks, then they will break apart in the oil. Also, the perfect temperature is also important here. The temperature of the oil neither too hot nor too cold. Don’t keep the heat turned to high, only fry it on medium heat. This will give the jamuns a smooth look. Why my gulab jamun is hard? They will become hard, if you fry them on high heat. Frying jamuns on high heat will harden the them. They would be cooked from outside and remain uncooked from inside. Also, they won’t soak up the syrup. They will also turn hard, if the dough is very stiff. So make sure that the dough is soft enough and you can roll it easily. If roll them hard for shaping into balls, then they might turn hard. Simply grease your palm before shaping balls, this way you’ll be able to roll the balls softly. Also this step would also ensure that the dough doesn’t stick to your hands. How to make perfect dough for gulab jamun? For making for gulab jamun, knead them into a smooth dough. But do not overwork the dough, you just want to mix all the ingredients together till they combine to form a dough. It should be a sticky and slightly wet dough. This will ensure smoother balls that won’t crack when you fry them. Best Gulab Jamun Recipe | How to Make Gulaab Jamun With Khoya — Gulab Jamun is a legendary Indian sweet. 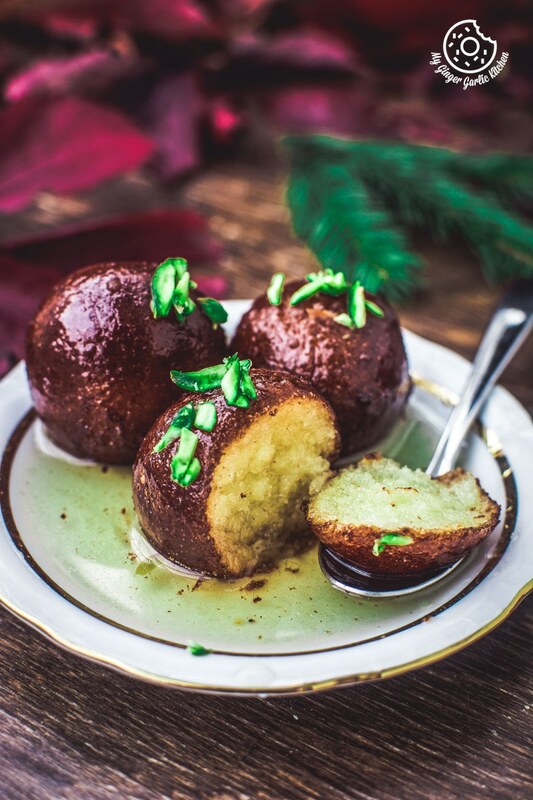 In this surefire recipe, the delicate, spongy and melt-in-your-mouth berry sized deep-fried milk based balls are dunked into the skillfully flavored sugar syrup. These homemade gulab jamuns made from traditional mawa or khoya tastes the best. 2. Let the water boil till sugar syrup is slightly thick and forms almost 1 string consistency, but it should not be very thick. 3. Now add lemon juice and stir well. 1. Add 5 tbsp milk to semolina and let it soak for 10 mins. 2. Add soft khoya/mawa to a large mixing bowl and knead it well for about 3 minutes. 3. Add all purpose flour and knead to mix well. 4. Now add baking powder and soaked semolina. 5. Knead again to make a smooth dough. Add some milk if needed. 6. It should not be too dry or too dry or too wet. You should be able to roll out smooth balls with your palms. 8. Remove them with a slotted spoon and add them to the sugar syrup and let them cool for 5-6 minutes. 9. Add gulab jamun to warm sugar syrup. Syrup should not be too hot. 10. Let them soak in the sugar syrup for at least 2-3 hours or overnight. 11. Garnish with pistachios and serve warm, at room temperature, or cold. 1. Don’t add gulab jamuns to the syrup immediately after frying. This might cause the gulab jamuns to lose their shape and they might turn chewy.